The implications of site in architectural design are well known, this project takes an approach to site investigation by encouraging the class to assemble a document that serves as the natural criteria from which the design intervention would be designed. The Masonry Pavilion employs modular building materials as an introduction to the logic of construction and materiality in an elemental manner. 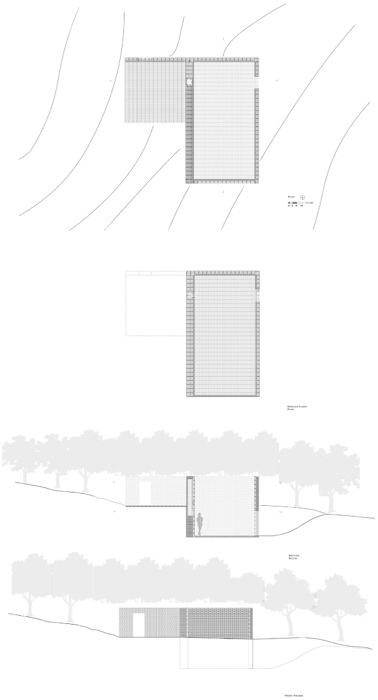 Presented to the students as a set of three distinct volumes of predetermined size and geometry, a cube, an “L” shape and a bar geometry, the volumes were placed independently on the site, a public park outside of Charlotte, North Carolina, in response to site characteristics the class site research. Each volumes unique proportional and directional qualities, were strategically placed on site to complement the given geometries unique qualities. The three factors expressly focused on were: proportion, location, and orientation.